Hello Everyone! Welcome to our new Merry West English Blog! We are so excited to make new friends and help everyone improve their English every week here at MWE! My name is Kristin and when I not teaching at school, I am at home taking care of my dogs. 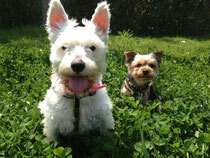 Their names are Mochi (white Westminster terrier) and Daisy (Yorkshire terrier). Mochi is very happy all the time. She loves to play with kids and walk outside. You can see in the picture that she always has a big smile! Daisy is a happy dog too, but she can be a little shy so she likes to stay home and relax. This week we are busy getting ready for Merry West's first Family Fun Day by the Suzuka River near the Ueno Intersection at Route 1. This area has a lot of space for the children to run around and also for the parents to relax with a cold drink and some BBQ. We are really REALLY hoping that it doesn't rain on Sunday so we can have a lot of fun with everyone playing games and enjoying lunch. Would you like to join us? The party is free but please bring your own bento or some food to put on the BBQ. Also, we were officially introducing our new teacher Megan at the party and she is excited to meet and play games with the kids too! Her boyfriend will also be joining our party so it is a great chance to speak English with many foreigners and your friends! Hope to see you there! Have an awesome week!